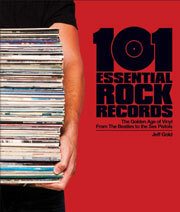 Vinyl records have obsessed Jeff Gold for more than 40 years. A collector, rare record dealer, music historian and former major label executive, Rolling Stone named Gold one of the world's five "top collectors of high-end music memorabilia." As executive vice president/general manager of Warner Bros. Records and a senior executive at A&M Records, Gold worked with artists including Prince, R.E.M., The Red Hot Chili Peppers, The Police and Cat Stevens. Please join us as we welcome the GRAMMY Award-winning author of the new book 101 Essential Rock Record, to the Clive Davis Theater for an engaging, multimedia presentation and panel discussion about the recent "vinyl revival." Joining Gold on the panel will be founder of Elektra Records and Nonesuch Records, Jac Holzman, long-time music industry veteran Jeff Ayeroff and founder of photography and interview project documenting vinyl collectors Dust and Grooves, Eilon Paz.